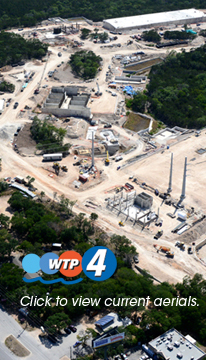 WTP4, Austin Water’s newest water treatment plant is completed. The plant, which is located on Lake Travis, is capable of treating 50 million gallons a day (mgd) with room to expand to 300 mgd. This investment will add reliability by giving utility customers an additional plant that draws from Lake Travis instead of Lake Austin, save energy in serving the north and northwest Desired Development Zone, and provide for continuous service during shutdowns and repairs of Austin Water’s two other treatment plants and aging pump stations which are critical to getting water to customers. WTP4 featured an unprecedented environmental commissioning process that worked to protect the environment at every step of construction and into the future. Why does Austin need another treatment plant? Between 2000 and 2010, Austin's population grew by 20%, and for years has ranked as one of the fastest growing major cities nationwide. This logically means water demand will increase sharply in the years to come. Growth projections for the City of Austin predict that the population will increase by 500,000 people by 2040; this is on top of the 812,025 who lived here as of April 1, 2011. Austin's aging water infrastructure magnifies the problems with increased demand. With the decommissioning of the Green Treatment Plant in 2008, Austin was left with only two water treatment plants: the Davis Water Treatment Plant, built in 1954, and the Ullrich Water Treatment Plant, built in 1969. Both draw water from the same source, Lake Austin, and both are decades old, which increases the risk of shutdown. WTP4 will add reliability by giving Austin Water Utility customers an additional, newly constructed treatment plant that draws from a different water source and will provide for continuous service during shutdowns and repairs for the other treatment plants. View our new video by clicking here.